What led to you actually writing an episode? I had, on a lark, asked if there would be any opportunity for me to write this season. We had a month break over Christmas—the actors did, but the writers only had a couple of weeks. So I came back with the writers’ room, and I was with them for a few weeks. 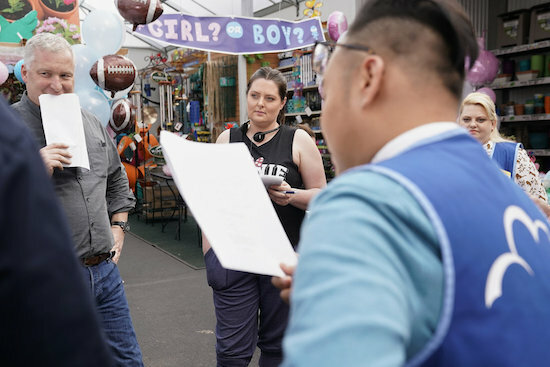 We broke the story together, as a group, and obviously Justin Spitzer, the showrunner, was overseeing what the story points were and what the arc of the season is, and all those kinds of things. I was there from ground zero for that episode, coming up with things. And then I went away and wrote a draft, and then it goes through multiple rewrites, as is the norm. I’m really happy with the way it turned out. Also, the writer is on set all day every day [during filming of their episode], basically with the director. They can go in, pitch jokes on the fly, things you didn’t think of before. That was so fun for me, because I have an improv background. I improvise a lot on the show myself, but I was super excited, because I was like, “Now I can improvise for everybody.” [Laughs.] So what was great, was when I watched the final cut—I do a cut of the episode, but then Justin gets the final cut—he had gone with a lot of those improvised jokes. That made me pretty happy. There’s something that feels so satisfying that you think of something in the moment, it’s really funny, and then it makes it all the way to the episode. Feldman's directorial debut airs April 12; Ash's penned episode airs April 19. How did your castmates handle you writing the episode and pitching them jokes? They treated it like any other episode. What was great was they were open to my flying in with, “Here’s another joke!” It’s super collaborative to begin with, because we improvise so much, so people were doing their thing. At one point, Ben Feldman was like, “No one ever writes me good alt-jokes.” So in the next break, I was like, “Guess what, buttercup, here you go!” And I gave him a joke and it made it to the cut. You whine about it, and I fly something in! It was [Nico Santos’] Mateo talking about a movie, and Jonah say, “I haven’t watched it yet. It’s on my list. We’re in a golden age of television!” That was it! You tweeted about getting your grandmother’s name on Amy’s name tag. What other little bits of your life were you able to incorporate into the episode? That was the big one. I also, in a previous episode that I didn’t write, my cousin—who I’m very close with; we’re more like sisters—told me it was her dream to be on Amy’s name tag. And so I got that. And our prop guy made her one of her own that I sent her because she loves the show so much. There’s always touches here or there with the names. There’s always a name that has some meaning to someone, which I think is really cute and a fun tradition to have built in. But in terms of my episode, I can’t think of anything that was personal to my life. But what is in there are things that are personal to my sensibility. I laid eyes on Michael Bunin [who plays Jeff] in that hat, and I said, “Oh my God, it looks like Freddie Mercury is going fly-fishing.” And I realized I needed to have Mateo say that. I ran into the room and pitched the joke. There were a lot of things with Nico I came up with in the moment. There was a joke where Feldman had said, “I can do this, I’ve done plays.” And later he says to Mateo, “You’re really good.” And Mateo’s like, “I’ve also done plays!” That was also something I came to in the moment. It was all so fun. At this point, we’re three years in. So getting the opportunity to do this is great, because we know these characters pretty darn well. We’ve all been there since the beginning. So getting to make them say these things was so fun. It was a challenge, in a lot of ways, obviously, but it was the most delicious challenge: I hear these voices and I know exactly their point of view of all of these people. My favorite line in the whole thing that I wrote was Sandra’s [played by Kaliko Kauahi] line in the breakroom where she talks about Jerry’s family coming to the hospital for his catheter removal. We’re blessed that we have a character on this show where I can actually get a line like that in. It’s a real gift. What inspired you to write in Colton Dunn’s Garrett impression of Mark McKinney’s Glenn? I feel like that had been a mentioned in an older script. but it was so funny. He was killing me that day. He improvised a bunch of things, because Colton has a very strong improv background. I thought that whole bit was hilarious. Somebody else pitched a joke in the room of, “Oh, hi, it’s me Glenn. I’m sorry, I was in the shower.” Which was so funny. I wish I could credit who gave me that joke, because it was such a funny line. [Laughs.] He’s at work! That’s the thing: I love the show so much. I love being a part of it, but I’m also such a fan of getting to watch all my coworkers. You know they’re hilarious and amazing because you work with them every day, but when you have that outside view and you’re watching take after take, and the improv and choices…it’s truly a special thing. From the beginning, we’ve had something special. But that week reminded me of that. And America and Ben have spoken to that, too. When you have that step back, when you’re doing another job, you really start to recognize, wow, these people are talented. It’s an amazing thing to watch. You’re also very active on social media. How was it getting to watch the episode “with” fans? First of all, people have a perception that the writer chooses what the story is. Which is not true! When I found out what was happening, I said to Justin, “I’m going to have to send you a big fruit basket, considering my episode is the one where you see Amy and Jonah really kiss.” [Laughs.] What a gift to me! I had a feeling the die-hard fans were going to be super excited because everyone is obsessed with Jonah and Amy. But obviously there is the obstacle now that she’s pregnant with somebody else’s baby. What I think is interesting is there was an internet movement [to say], “No it’s actually Jonah’s baby! And that kiss was because at the golf course they actually slept together.” In the week between my episode and the next episode, there was all this fan reaction. I love that people are so invested in Jonah and Amy that we have to believe this is his and it’ll keep them together. So I know there was disappointment it was what we said it was. But it’s amazing. People have reacted so strongly one way or the other about that whole story choice. What I think is amazing is that people are that invested. There’s a girl who messaged me who was like, “I hated this! Why is this happening?” And I engaged her, because I was like,”Okay, cool, what do you hate about it?” And she backed down. But to me, I wasn’t offended: I think it’s great that people are rooting for Amy so hard that they’re genuinely devastated that this obstacle has occurred in her life. It speaks to how much the show resonates and people have really gotten rabid and invested. Looking ahead, are you hoping to write another episode? I don’t know! We have a huge crew of amazing writers, and there’s only so many episodes to go around. There are a lot of things that depends on. But I would absolutely do it again if offered. Amy being pregnant with Adam’s baby wasn’t a great writing choice and not Ash’s fault, but people who didn’t want it weren’t just complaining because it wasn’t Jonah’s or whatever. 19 episodes of Amy being poor and begging for a raise and the entire discussion of this unwanted pregnancy and its impact on Amy and Emma is just … nothing. 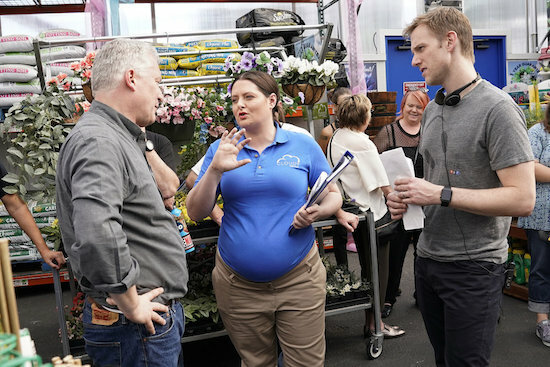 Gender Reveal was the start of Superstore breaking my heart and ruining my enjoyment.